This video would fit in well with a science or geography unit on the Amazon, as well as a study on the carbon cycle, the greenhouse effect, deforestation, or global warming impacts by humans, especially as regards dam building. The video discusses a scientist's research on the relationship between the Amazon forest as a carbon dioxide sink, deforestation as a result of building dams, and deforestation's contribution to climate change regarding less carbon dioxide being sequestered and more methane being released from reservoirs and dams. Comments from expert scientist: Good demonstration of climate change relevant measurements, i.e., measuring CO2 flux in the Amazon. Although that the explanation could be more complete. The data used is dated and has an indirect message. Video is accompanied by lesson plan, teacher's guide, transcript, background articles, and workbook for students. 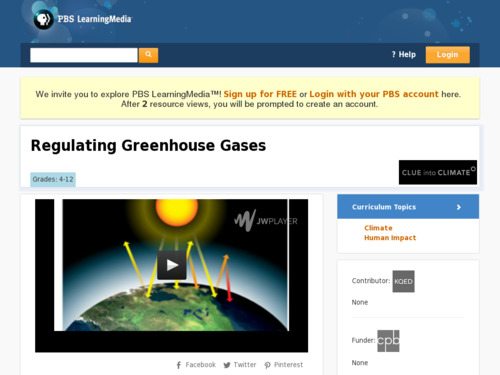 These supplmentary materials expand the ease of use of the video within a unit about regulating greenhouse gases. The video is best viewed on desktop or projected on screen in classroom, as it is slightly pixellated when enlarged.